My Creative Existence: Paper Art Doll! Back in January, the challenge theme over at Inkurable Stampers was Paper Art Dolls! 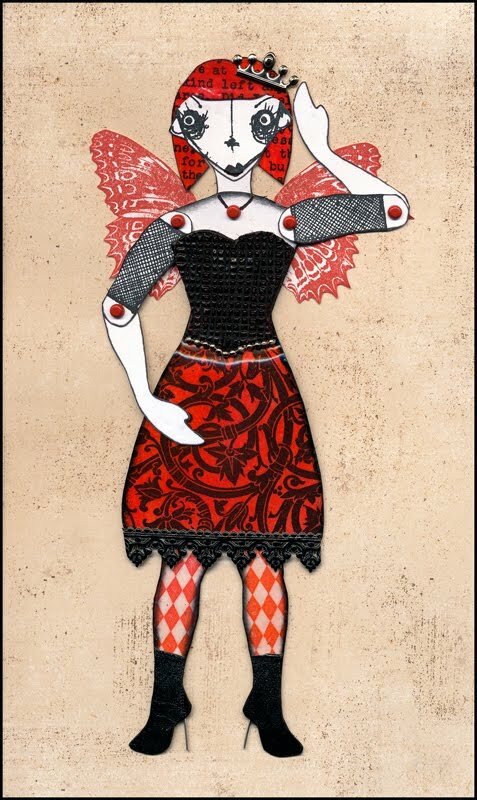 I have used stamps from Stamp-it (Harlequin on legs and Mesh on bodice), Stampotique (Mesh on arms; face; text on hair) and Darkroom Door (skirt pattern, and butterfly wings). I printed the paper doll template from The Enchanted Gallery onto white cardstock and cut out the pieces. I used a Collections chipboard dress form and bodice instead of the supplied body. The text on the hair was stamped in black ink and then I coloured the hair with red ink. I clear embossed it for strength and shine. Her skirt was hand drawn and was decorated the same way, using the Darkroom Door ornate pattern stamp. I added some German Scrap trim to the bottom. Her crown is a silver brad. The harlequin pattern on the legs was stamped with red ink, and then clear embossed. The shoes were created with some German Scrap and some metal wire for those killer heels! LOL! The face and the mesh on the arms were both stamped onto white cardstock with black ink. The bodice was coated in a thick layer of UTEE and while it was still hot I pressed the mesh stamp in it and allowed it to cool before removing it and revealing the textured pattern. I added some chain at the bottom of the bodice for added interest. 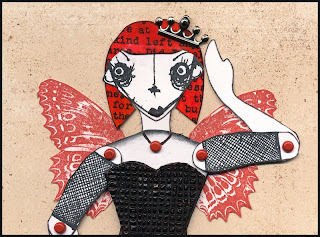 The butterfly wings were stamped with red ink onto white cardstock, cut out, and attached to her back. Her legs, arms, and head were all attached with red brads, and they move around! We had some awesome Paper Art Doll entries that month, and you can see them all in the slideshow here. That is just gorgeous Sarah! this is a fabulous piece! I just love every detail. I really need to share this with my daughter because she dresses very similar (but her face is much prettier)! Gorgeous art!